I love the saying “Happiness is an inside job.” It means only I can create happiness in my life. It’s my definition of happy; it’s my rules on how to get there. But what if you’re feeling stuck? What if your happy up and flew out the window? Well then, it’s time to turn back inside and create that feeling once again. 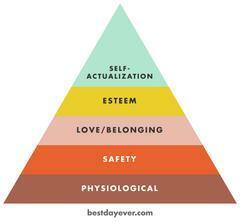 Abraham Maslow developed what he called the “Hierarchy of Needs,” which essentially says we must take care of our basic needs to live and be safe before we can begin to work on love and belonging, self esteem and, finally, self-actualization. With his hierarchy in mind, it may be you need to look lower down the pyramid to make sure your basic needs are being met, and build from there. If your health is not as robust as you’d like it to be, that’s a good place to start. Simply making better nutritional choices, getting movement daily and getting enough sleep can have an amazing positive effect on your health, well-being and energy levels. I’ve seen friends turn their dreary outlook into a sunny attitude by focusing on their health. They literally turned their frown upside down with regular exercise and a focus on good nutrition. She documents her happiness project in her book, as well as online, where you can download five different 21-day happiness projects (such as Quit Yelling at Your Kids and De-Clutter Your Home & Your Life) for a small cost, along with a number of free resources to help you get started on your own happiness project. Remember, happiness is an inside job, so let your intuition help guide you. Deep down inside, you probably know what makes you happy. Take a minute to list the things that light you up, and see what items you can do now. It can be as simple a listening to your favorite music and singing along at the top of your lungs. Action often makes us feel more energized. How will you find your happy today? One final note: Lack of “happy” – not being quite satisfied with your life or feeling temporarily out of sorts – is very different from clinical depression. If you think you may be suffering from depression, take the courageous step to ask for help.